Colombo Fire Chief Rohitha Fernando said that the Fire Brigade is conducting a program to identify areas which are major risks and were evaluating them. Caretakers and managements of that building will be warned about the risks and advised to take necessary preventive measures. The areas will be closely monitored by officers and if they had failed to adhere to the instructions they will be reported to the Colombo Municipal Council. According to the Municipality Ordinance it is an offence not to act on behalf of the safety of the people or workers. If heads of departments of these state buildings fail to adhere to the safety notices issued by the Fire Brigade it will be taken up at national level, Fernando said. The story you are about to read is like from a Ripley's Believe it or not episode. 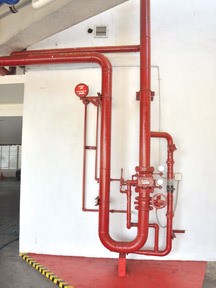 It is shocking to learn that some high-rise buildings in the city of Colombo do not possess fire fighting equipment and have even neglected fire safety rules that are compulsory for their own safety. Some buildings do not even possess fire extinguishing cylinders or hoses which is a must at every floor level. In some buildings fire exits are blocked for various reasons. Fire Brigade officials on a recent inspection tour saw that fire exits in the eleven- storey Labour Secretariat building in Narahenpita were blocked by small eateries. The space reserved for safety exit points have been used to store various unimportant material. Fire safety inspectors noticed in another building the fire exit being blocked by a person running a small tea kiosk . He was running the kiosk with the blessings of the management so he did not bother about fire emergency or any other emergency! When this was was brought to the notice of the management there was a hullaballoo and it was immediately ordered to be cleared. But as usual when the fire official went there after sometime it was back in operation. The Twin Towers housing the World Trade Centre in the backdrop of the Bank of Ceylon building is the iconic building identifying the heart of the city of Colombo. Yet this monument that is the pride of the city will soon be overtaken by new monster sky-high buildings which are still in the making. 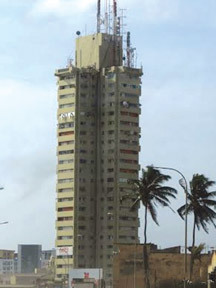 Before these skyrise buildings came into existence in the nineties, there were only a few high-rise establishments that governed the Colombo skyline. Beginning from the Labour Department building in Narahenpita, the Mahaweli Ministry building in T B Jaya Mawatha, Public Administration building in Torrington , the Sathosa building in Vauxhall Street, the Telecom building in Fort and the Ocean View tower in Bambalapitiya were the skyrises that adorned the city of Colombo. Although all these buildings are built to last decades an alarming issue has taken centrestage and opened the eyes of the authorities-the safety of these old buildings in terms of a fire hazard. When fire safety is considered as far as any modern building or an establishment built with state- of- the art fire detection or prevention systems, the structures of these old buildings are appalling. None of these buildings possess a satisfactory fire detection system at present nor are any of the fire safety rules being observed by the authorities. 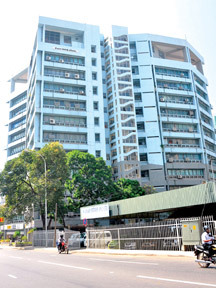 The Colombo Fire Brigade has identified them as the most high risk fire hazard establishments in Colombo city where managements have been informed on several occasions to upgrade their fire detection systems or to introduce new ones. State departments being housed in these buildings have been requested on numerous occasions to follow fire safety rules for the sake of the large number of employees moving in and out on a daily basis. The Labour Department building was built in the sixties to house state offices which were earlier scattered in the Fort and Pettah areas. 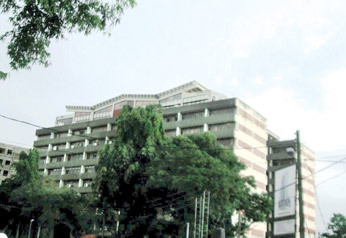 A building which is over five decades is presently used for an important purpose such as storing personal records of thousands of employees who work in various offices. Not to mention that it has piles and piles of old documents stacked in layers for many years. One can't imagine what the repercussions would be if a small piece of paper caught fire! 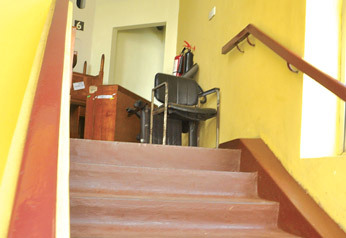 The Mahaweli Ministry building is another chaotic area where the entire fire safety staircase of the 12 storey building is blocked and out of use for many years. The building is supported by an elevator and a staircase at the front as well as with the fire escape staircase at the rear. The fire exits leading to the rearside staircase on each level is blocked by rubbish and broken office stuff. The fire exits are practically for all intents and purposes unusable for the past two decades since its establishment in the late seventies. The officer in charge of the administration admitted that the building lacks a proper fire safety system and that the fire escapes were blocked. Due to the lack of space most of the office ware and other irrelevant stuff has been stored in the space in the fire escapes. When questioned whether the fire brigade had issued warnings about the prevailing system the officer replied in the negative saying that nobody had informed them about such a hazardous situation. However, the officer admitted the fact that a thousand odd staff faced a grave situation in an emergency by not using designated fire escape and the fire exit stairway. The twelve-storied Sathosa building is also noted for its haphazard fire safety system. It was not an easy task for fire fighters to douse the fire that broke out on the seventh floor last July. The Colombo Fire Brigade has to call in eight fire engines to control the fire that showed signs of spreading all over the age- old building that was built three decades ago. Ironically, admitting the fact that the prevailing fire safety system was not satisfactory the administration officer of the Public Administration Department told the Sunday Observer that the Department annually calls for tenders from private companies to refill fire extinguishing cylinders. The officer spoke on terms of anonymity and said that they have already been inspected and informed by the Colombo Fire Brigade to upgrade the present fire safety system. As a result the Department is planning to conduct a fire drill next week and to hold training sessions for staff. However, it's the same story once again the implementation of a proper fire detection system with alarms and detectors will take awhile to be put in place as funds were insufficient and there are unconfirmed reports that the Department of Public Administration will be shifted to new premises in Battaramulla in the near future. According to the Divisional Fire Officer (Prevention) Wimal Kularathne confirmed that although every person was well aware of a fire risk, none of these buildings possess accepted fire safety systems. The buildings lack modern state- of- the- art fire detection systems that would enable thousands of lives to be saved in the event of an emergency. flooding of water and destroy the property. In an emergency a fire engine can even link to the fire service inlet of the Wet Riser system in a building. It is paramount that a sound fire safety system should be included with heat and smoke detectors, sprinklers fixed on to the roof or the ceiling not forgetting fire alarms. Apart from those old buildings another area that had been identified by the Fire Brigade are the congested supermarkets in Pettah. Fourteen supermarkets in Bankshall Street, Second Cross Street, Third Cross Street and Keyzer Street have been identified as posing a grave risk in a fire emergency. These five storey buildings have a space at back call "Rare Space" an empty strip of land reserved between the building and the boundary to generate ventilation. But it has been noticed that many unlawful vendors had occupied this area and constructed illegal constructions for commercial purposes. This could lead to a major destruction in a fire emergency since there is no ventilation from the rear and that a fire fighter could enter only from the front.